Good morning! I have another quick & easy card for you today but this one is a baby card. I whipped up 10 of these in no time a couple weeks ago. 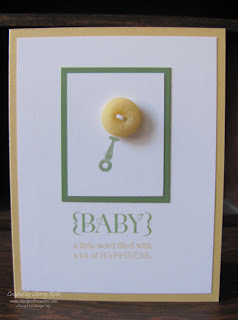 I love the stamp set Button Buddies - it is a great set for all occasions. You could easily reproduce this baby card using the snowman image, change out the greeting and the colours and you've got a great Christmas card! Thanks for stopping by today! Have a wonderful weekend.